grandma's cookie jar: grandma's cookbook - Raspberry Ice Cream Pie! weather it is the perfect time to get together with others to enjoy a meal! Of course, when the weather is warmer, baking is not at the top of my list of things to do, so it is the perfect time to make up those no-bake recipes. A couple days ago I wanted to make a dessert, but didn't want to bake, so I took a can of apple/raspberry juice concentrate out of the freezer, mixed it with a tub of Extra Creamy Vanilla Ice Cream from Bryers, mixed two cartons of heavy cream, combined everything and put it into two cookie pie crusts (graham would work fine; as would chocolate cookie crust if you like chocolate and raspberry, but my favorite is the shortbread cookie crust!) and popped them into the freezer. 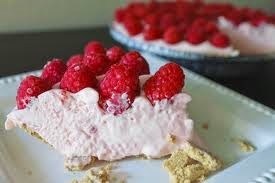 When it was time to serve the pie, I topped each piece with a few lovely, fresh raspberries! This pie was tasty, slightly tart and so cool and refreshing; the perfect dessert for Summertime! This recipe is so simple to make; it is a perfect dessert for your grandchildren to make as all they have to do is mix ingredients and put them in a pie crust! Plus, since the recipe makes two pies, you could have them make one for their family to enjoy and then take the other to a shut-in or neighbor to brighten someone else's day!